Featured image from www.thewitcher.com. 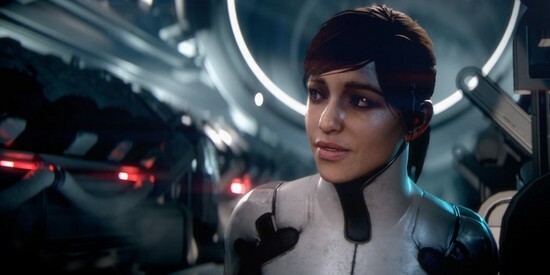 In-game screenshots taken by Isabel Payne. All rights belong to CD Projekt Red. There is a reason the Witcher 3: Wild Hunt sold more than six million copies within the first six weeks of its release and has won over 800 awards (including an astonishing 250 Game of the Year awards from various companies). It has been over a year since this masterpiece was released and even though I’ve logged over 170 hours into this game and its two DLCs, I’ve yet to actually finish it. Based on a popular fantasy book series of the same name by Andrzej Sapkowski, the Witcher 3 concludes the adventures of Geralt of Rivia, a genetically mutated monster-slayer-for-hire (called a Witcher) infamously known in-game as the Butcher of Blaviken. In the Witcher 3, Geralt must face the Wild Hunt, an army of specters which have made appearances as antagonists in the first Witcher game. The Wild Hunt is after Ciri, Geralt’s adopted daughter and former princess of Cintra, who has extraordinary powers that they wish to control to conquer other worlds. The main story line on its own is already long and packed with adventures where you can explore the open-world from Novigrad to Skellige. But in order to get a full experience of the Witcher 3, the side quests are, in my opinion, what makes up most of the meat and are the best part of the game. They give more opportunity for Geralt’s character to really shine in situations that are not always as dark and serious as the main storyline. Some of these side quests are packed full of easter eggs and real world references, as well as hilarious situations that can easily be missed by simply choosing the wrong speech option (who else got into a rap battle in Beauclair?). Not only are these side quests actually being useful in levelling Geralt up and earning coin and cool gear, I felt they also brought a different light onto the game and helped build the intrigue into Geralt’s life with actual Witcher contracts and pleas for assistance from old friends. Some side-quests even include the popular, and highly addictive, in-game card game called Gwent. I made the mistake of not listening to the NPC who was so kindly explaining how to play the game, and ended up losing hundreds of gold crowns to merchants and barkeepers over this game. As I spent more time actually paying attention to the rules, I found myself excitedly searching for new characters to play against or adventuring across the map trying to find new cards. Of all in-game mini games, Gwent is the only one so far I’ve actually enjoyed playing and am excited to try the stand-alone Gwent: A Witcher Card Game set to launch later this month. Having a background knowledge of the Witcher lore is a definite bonus as many characters and stories are referenced throughout the series. Since I’ve only read The Last Wish, which is a compilation of short stories of Geralt’s adventures, I found I had to read a lot about the lore in the game’s journal system and online in order to have a full grasp of what was happening in the story and the importance of certain characters. 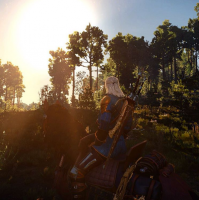 A general knowledge of the game’s lore can help with understanding relationships between characters, which plays a significant role in this game and while the majority of the game’s NPCs will show hostility or dislike for Geralt, he does have many he friends (and lovers) he holds dear. The Witcher 3 allows you to explore these relationships in-depth and gives you the option to pursue them more fully or simply leave them be. While the story itself is massive and complicated, the in-game area you get to explore is even bigger. The land itself is beautifully constructed and has many secrets to reward those who actually go adventuring off the beaten path. 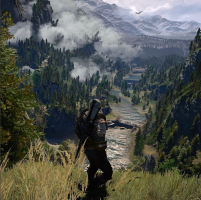 The game’s landscape ranges from beautiful mountains, to rolling hills, dotted with settlements both large and small. I’ve often ambled through a forest to come across gorgeous Elven ruins, lost to time and covered with flora. 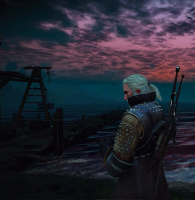 However, while there is much beauty, the darker side of the Witcher universe is still very much present. It is not uncommon to emerge from a flower-filled forest onto scorched fields scattered with corpses and drenched with blood. Rotting bodies hang from trees along main pathways to settlements, and it’s easy to stumble upon a horrific monster or two feasting on the body of an unfortunate traveller. 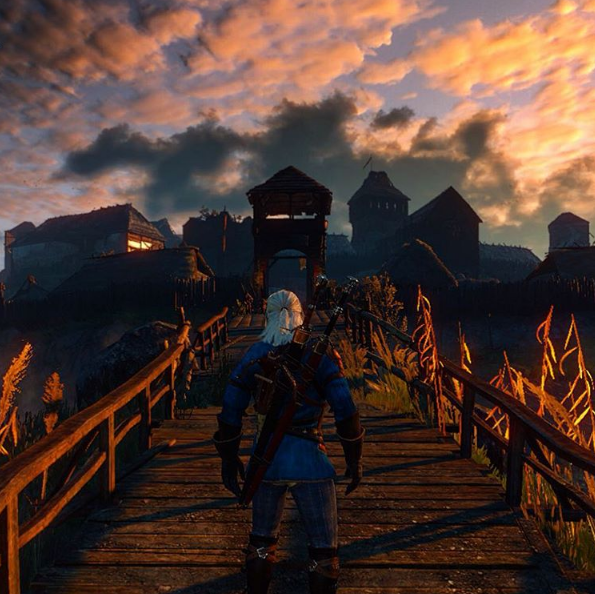 The world of the Witcher 3 is by no means a kind one and it’s quick to remind you of that. What really helps put a game together is the music that goes along with it, and the Witcher 3’s OST is a brilliant example of how to tell a story through sound. The ambient sound in the game alone help create an atmosphere that is almost real—that is, until the screams of a Drowner or the wings of a Wyvern flap above you snap you back into the real world. However, the soundtrack is what truly brings this game to life with its primal cries and strong percussion rhythms. Expect powerful music throughout composed by Marcin Przyby?owicz, Mikolai Stroinski and Percival to amplify the atmosphere of the game. Whether it amps you up for a battle or draws tears at emotional cut-scenes, The Witcher 3 boasts a soundtrack like no other and, on its own, provides over two hours of adventures across the lands of the Northern Kingdoms. My favourite? A ballad about the romance between Geralt and the sorceress Yennefer of Vengerberg called the Wolven Storm, sung by the bard Priscilla towards the middle of the game. I've only had a couple annoyances with the Witcher 3, one of which being the sheer size of the map. With fast-travel being limited to travel to and from designated signposts, expect a lot of wandering on foot or by horse to discover new signpost locations when entering a new location. The combat system is also a bit more complicated than a typical slash-and-smash. Geralt has the ability to use magical Witcher signs that can set enemies alight or influence their minds. You can also brew up many oils, potions and other concoctions to give Geralt an edge over his opponents. I've found it can be difficult to remember the many combination of oils and signs to use on an enemy, especially if you’re a lazy gamer like me and run into a monster fights without learning about your foe in advance and reading about them in Geralt’s Beastiary. Despite these things, The Witcher 3 is definitely a game I intend to replay at some point once I’ve finished reading the novels. For the first time in a while, I felt that I really got my money’s worth when purchasing the game and its DLCs, and I'm genuinely afraid that I'll never find an RPG quite as fantastic as the Witcher 3. The Witcher 3: Wild Hunt is available for PC, Xbox One, and PS4. 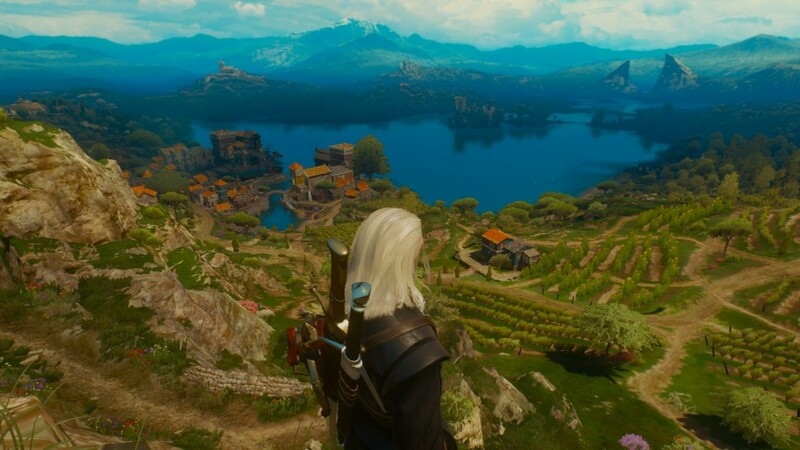 The Game of the Year edition was released this past August and includes all of the game's expansions including Hearts of Stone and Blood and Wine. 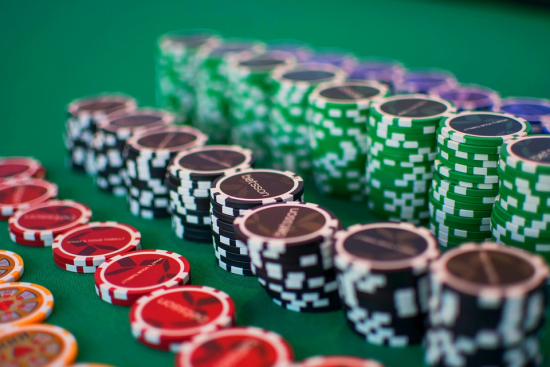 Online Casinos - Are They Secure? We know that playing at a safe and reputable establishment is pivotal to every gambler, and that is why we decided to delve into the safety of online casinos.